The Director General, Institute for National Transformation, Prof. Vincent Anigbogu has identified the church as the answer to the myriads of problems facing Nigeria as a nation today. Prof. Anigbogu who was speaking in a message entitled,” Understanding the Season of God in this Time”, which he delivered at the Olivet Bible Church, Festac Town, Lagos on Sunday, to mark the maiden edition of the Pastoral Appreciation Day of the church observed that if the church did not take a strategic position, the nation called Nigeria would not exist for long. Prof. Anigbogu whose message for the day was majorly drawn from the gospel of Luke chapter 11 verses 5 to 8 noted that it was midnight in the Nigerian hour and that the spirit of darkness has descended over this nation thus the need for the church to brace up to the challenge and come to the rescue of the Nigerian state. According to him,” I submit to you that it is midnight in the Nigerian hour, the spirit of darkness has descended over this nation and if the church does not take a strategic position, this nation called Nigeria will not exist for long”. “The answer to the society is in the church. The lord says to the church in Nigeria, until your way pleases me, I will not make your enemy at peace with you. Which makes me think that what is happening, God’s hand is in it to wake us up”, he said. He identified three critical areas of humanity that was experiencing midnight hour to include; the social sphere where he disclosed that people no longer have regard for holy things and places anymore the reason why someone should go and detonate a bomb at a church and killing worshipers who came to worship God to the extent that people now live in fear to worship their God, something he said was never heard of. He also pointed out midnight in the psychological sphere where he said people were stressed out, terrified and live in the fear of the unknown for what the future hold for them as well as the midnight of the moral order where people now define what is right and wrong for them away from the age long tested and trusted morality. The Director General stated that according to the scriptural text read, even though it was midnight, somebody was still hopeful expecting solution even as he said that the people were turning to the church for solution in the midst of the midnight and that the church which has the answer should make itself available to the people who turned to it for solution and not turn its back on them. The Professor however chided the church which confined itself to the comfort of its wall while overlooking the society as it languishes in pain and agony seeking help from the church which was not willing to help stressing that unless the church come out of its confinement and reach out , the society may have to wait a little longer. “Everything the church is doing is confined to the four walls of the church, they are not impacting the world, and they are not impacting the society. There is certain policy that has been put in place to deny you and your children; you cannot change it until you go out there”. “The Church is disappointing the nation in an immeasurable way and we are doing that because we are so self-focused. The church is comfortable and the society is languishing. God is not happy with a church that is so engrossed with itself that it does not affect the society”, Anigbogu submitted. 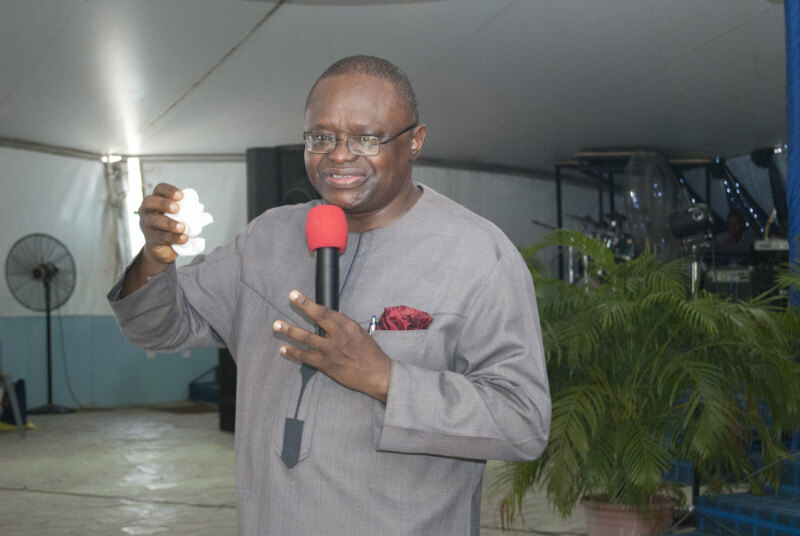 He regretted that some of the Ministers and Churches don’t realize the season appropriately thereby conducting the first day ministry on the third day and people were applauding them because they don’t understand the time and season of God. “There are church members that are still coming to the church thinking it is a first day church saying if I jump, dance and sing, I have finished , when they are supposed to discover their purpose”, he said. While congratulating the Pastors and the members of the Olivet Bible church, he charged them to let the celebration launch them into a new beginning and into a new season not just for the church or for the pastor but for them as individuals. “It is a new season, we can’t do church the way we used to do it”, he surmised. Responding on behalf of other honourees, the Senior Pastor of the church, Pastor Owen Chukwuemeka Nlekwauwa appreciated the members of the church for the honour done him and two pastors of the church. Pastor Nlekwauwa who was overwhelmed by the level of organization that was brought to bear on the event by the planning committee members of the church poured encomium on them saying that this has shown that they can handle anything in the church if he is not around. “My appreciation goes beyond the gift of a car by the Olivet Bible Church knowing the trials we have been passing through I shouldn’t have expected that this car gift should be coming from this church at this time. Members of Olivet Bible Church, I can’t find expression enough to thank you”, Pastor Nlekwauwa said. He prayed that everyone that made one contribution or the other towards appreciating the pastors would have made the necessary push required to receive from God upon their lives stating that in the fullness of time, the rewards would be released and they would testify. Other Pastors honoured at the event were Pastor Iyke Joel Ogunna and Pastor Mrs. Ngozi Esther Nlekwauwa.